What, then, is the aura? A strange tissue of space and time: the uniqueBapparition of a distance, however near it may be. Writing in 1936, Benjamin saw the relatively recent proliferation and massification of images, especially of mechanical reproductions (photographs or films, for example) of artworks, as a symptom of a popular desire to overcome the distance imposed by the unique work of art and, consequently, to overcome as well its uniqueness, assimilating it via the reproduction. This resulted, said Benjamin, in a decay of the work's aura. In W. T. J. Mitchell's terms, what the mechanical reproduction does is to detach the image (viewed here as mere bintellectual propertyb) from the materiality and historicity that comprises the picture (understood as the conjunction of the immaterial image and a specific material medium). And while this process may leave the proprieties of the original work of art untouched, it seems somehow to: "(...) cheapen the work of art, draining value and 'aura' from it." This mechanical reproduction removes the replicated image from the sphere of tradition and historical authority that surrounded the original work, throwing it into a mass existence that is relatively independent from the original one. This allows not only for the work to circulate in a myriad of contexts and places where the original could never reach, but also to bring out aspects of the original that the human eye alone couldn't unravel, relying on technical or optical processes intrinsic to these technological means of reproduction, like a simple image magnification or even the use of x-rays, to bring out hidden aspects of the original image. But Benjamin saw these 'reproductive' technologies, like photography and more dramatically film, as being used not only as advances in the mechanical reproduction of traditional artworks, but as having their own place and value in the midst of the artistic processes. He recognized that more and more often "(...) the work reproduced becomes the reproduction of a work designed for reproducibility." Thus an art photograph, created especially for that purpose, although created by the same technologies of mechanical reproduction, would elude the benjaminian discussion of originality and copy for, as Benjamin himself said, if you can make any number of prints from the same plate (or negative or digital file) it makes no sense to ask for the 'authentic' print. The artworks created specifically for and by photography and film (and other means of mechanical reproduction, although not directly mentioned by Benjamin) would not b as their mechanical nature and a restrictive reading of the bWork of Artb essay would seem to imply b be inevitably be affected by a loss or decay of their aura. Instead they would draw their value from a more comprehensive and liberal use of the term 'aura'. This broader conception of aura stems from a more common understanding and usage of the term by Walter Benjamin himself - as can be noted throughout his "Little History of Photography". He applies the term to several objects, even to persons, seemingly referring to an "elusive phenomenal substance", that encapsulates its individuality and authenticity. A children's gaze, a man's jacket or a long-exposure photograph - all seem for Benjamin to be marked by a certain aura, for as he says in some early writings: "First, genuine aura appears in all things, not just in certain kinds of things, as people imagine." The aura as the poetic experience of "a distance, however near it may be", reveals itself as an aesthetic, perceptive and phenomenologic experience. It refers to the attraction pull that an work of art often exerts on its viewers and simultaneously the necessary distance (physical but also temporal) it imposes for its contemplation. This concept of aura is thus not an inherent propriety of the artworks, objects or even persons that elicit it, but instead belongs to the very medium of perception. And so the experience of aura can emerge in any artwork, even those created by means of technical reproduction. The work Fixed, by Madge CameronB (an alter-ego of the american contemporary photographer Rachel Phillips), is a captivating example of how such auratic experience can emerge. . The creation of this photographic series is involved in a narrative of technical reproduction, archival drive and accidental creation. 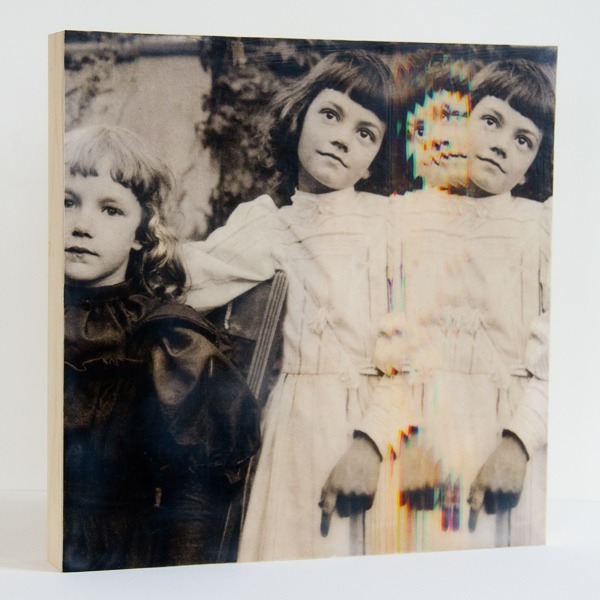 While working as an archivist at the Pacific Library Privé and Special Collections, digitalizing its extensive photographic compendium, Madge Cameron accidentally discovered that by moving the photograph while it was in the process of being digitalized she was able to create uncanny repetitions and a separation of the image's colour channels, generating an effect that somewhat resembled that of a 3D image. Fixed is thus created by the intersection of two different processes of mechanical reproduction: on a first stage the making of the original photograph (already marked by all the performative rituals that vernacular photography always implies), and secondly, after Cameron's appropriation, by the digitalization process. The original photographs derived their aura and value from their residual "cult value", from the emotional relationship of proximity, longing and remembrance one inevitably establishes with the photographic portraits of loved ones, especially absent ones. A nearly forgotten and mostly subconscious ritual basis that remains, despite our insistence on modern rationality, compelling us to treat such images with greater care, to be reluctant to deface or destroy them, much in the same manner we would be reluctant to inflict suffering on those portrayed. But their aura inevitably fades as the years pass and their loved ones disappear, leaving behind empty average pictures of forgotten persons that no one recognizes anymore. .
By the time Madge Cameron comes into contact with these photographs, most of them, if not all, have already lost much of their auratic value, being forgotten in the middle of an archive too vast and too impersonal for the individual images to assert themselves. They are severed from their original ritualistic and social functions. In a reversal of the benjaminian paradigm of aura, as proclaimed in the "Work of Art" essay, an 'aura-less' image is raised to the status of art precisely by the process of mechanical reproduction. The digitalization, instead of creating the intended unadulterated copies of the original photographs required by Cameron's archivist functions at the Library, becomes a creative process in its own, generating original and fascinating images capable of exerting that attraction pull on its viewers that defines, as already noted, the broader aesthetic, perceptive and phenomenologic experience of the aura. Paradoxically enough, it is the supposed act of 'copy' that generates the unique existence of Cameron's images. Emancipated from their initial and private cult values, these images re-emerge now invested with an altogether new aura, an exhibition value that marks them as works of art in their own right. Fixed is marked by a very contemporary fascination with the archive, appropriating vernacular photographs - usually viewed as banal and devoid of any value other than private and emotional - and turning them into objects of aesthetic contemplation, infusing them with artistic value. The original photographs and the narrative of artistic creation of this series draws a lot from the modernist idea of found-object. Everyone knows that there are just two criteria for a found object: (1) it must be ordinary, unimportant, neglected, and (until its finding) overlooked; (...) and (2) its finding must be accidental, not deliberateB or planned. Regardless of how Rachel Phillips came first to think about this project, all the narrative of accidental finding and creation that was deliberately imposed onto Madge Cameron's artistic process seem to point out, perhaps unconsciously, to this relation. Fixed, like the found-object and much of the modernist and contemporary artistic creation, draws from the vast imagetic archives of the uneventful everyday life, from the ordinarily unnoticed and overlooked, in an effort to bring them into view. By turning the Library's archive into an independent artistic creation, Cameron attempts to rescue this images from the collective amnesia they seemed to be faded to, while simultaneously blurring the boundaries between archive and art, between vernacular photograph and artwork, between high and low culture. Amongst the dichotomies explored by Cameron's artistic use of the archive, the distinctions between author and audience become especially interesting. Quite similarly to what Benjamin noted regarding the expansion of the written press, also with photography and the archive the distinction between writer and reader, creator and consumer of images, tends to lose its rigidity. Such differences become circumstantial, shifting from one moment to the next. Madge Cameron, the archivist and reader of those photos, suddenly becomes Marge Cameron, the artist, creator of new images. The resource to a previously existent archive inevitably brings into discussion questions of authorship, as it removes the author from an absolute position of authority and certainty. The artist in an archival paradigm is no longer the sole creator, but rather someone responsible to collect, organize, recombine and re-write visual information initially produced by others, using them as reflexive tools. It is thus no wonder that someone like Madge Cameron b a life-long librarian, used to being surrounded by astonishing quantities of knowledge generated by others, and certainly fully aware of the power that the curating, organization and re-distribution of such knowledge can have (the power of a library in itself, it could be said) b would choose to express herself as an artist-as-archivist. Having its foundations on the Library's archive, Madge Cameron's Fixed goes beyond it. 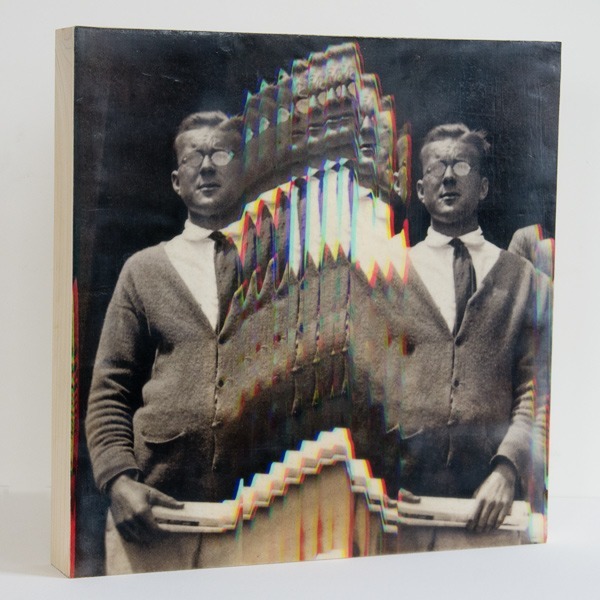 The strange repetitions and 3D effects that Cameron's accidental moving of the images being digitalized unleashed were at first viewed by her as a "failed work", a mistake that defaced the readability of the hypothetical perfect reproduction that was supposed to be attained. These failures, and their subsequent adoption as a valid aesthetic and artistic choice, can better be understood in the light of the theoretical reflections that surround the glitch art phenomenon. .
A glitch is defined as a slip, an irregularity, malfunction or error in a digital, computerized or networked paradigm. These glitches that deface and disfigure the original images can sometimes be found 'in the wild', untouched by human hand, the so-called "Pure Glitch" - an unpremeditated and unexpected error that may or may not have any inherent aesthetic value. But aesthetic of the accidental and of destruction is often then appropriated for artistic purposes, as a legitimate creative practice, that elevates random and senseless destruction into the realm of creative destruction. To these appropriated and domesticated glitches Iman Moradi calls "Glitch-Alike". Once again Fixed draws from a narrative of the accidental, of the found-object (in this case the found-error) and the subsequent adoption of this "process of interruption" comes to add another layer of mechanical reproduction to her work b the reproduction of the unforeseen glitch. If the original analog photographs of the Library's archive can be seen as remnants of a distant historical past, then Cameron's defaced digitalizations of it act as a ruin b not the 'natural ruin', a witness to the passage of time, but rather like the romantic artificial ruin, a picturesque deliberate recreation of the past as a semi-destructed image. And it is the adoption of the glitch aesthetic that potentiates this destruction as the creation of something original. The introduction of this creative destruction on top of vernacular photographs has also a de-familiarizing effect. The quasi-natural reading we are used to make of a family snapshot are interrupted by the unexpected character of Cameron's images. They live in a limbo state, neither intact nor completely destroyed, but instead, as Richard Galpin described it, as an act of bpartial erasureb, involving both the presence and the negation of the original meaning of the image, provoking new, deconstructive and ambiguous readings of the new work and the original picture alike. Cameron's Fixed breaks with our expectations of what is, or what should be, the 'normal' usage of the mechanical reproduction technologies. If in from of a 'normal' photograph (one without glitches or any other visible manipulations or failures) we can, on account of our cultural familiarity with such images, imagine the camera or the scanner as transparent technologies, the glitch comes to break this illusion of simplicity. It interrupts the imaginary bperfect flow of mediab and makes its fragmentary nature, its fragility and its failures visible. This disturbance of our usual visual routine inevitably comes to challenge it. The glitch-like images of Cameron's work show us an usage of familiar technologies, the scanner and the camera, taken beyond their "tipping point", to an extreme where they almost become new mediums, they challenge the established conventions and politics for their usage. And that inevitably leads to a need for reflection. Cameron's images become almost like meta-images, images that reflect (and induce reflection) on the processes of pictorial creation themselves. They ask for an active engagement of their viewers, hopping that their disruptive effect will force the spectator out of a passive contemplation and into a reflexive pondering on our broader and complex relations with Fixed, and with mechanical reproduced images in general. Rachel Phillips / Madge Cameron's work Fixed is involved in a very modernist narrative of chance, accident and archival immersion. It functions as a palimpsest, overlapping layer over layer of artistic creation and mechanical reproduction. It is a fertile ground for theoretical reflection, not only on questions of originality and copy, but also on the relationship of archive with personal and collective memory, on the fragility of time and memory, and on the potentiality of the destructive as an act of creation. Fixed might be a work of mechanical reproduction, but it evades all the derogative criticism Benjamin might have associated with the copy. All in all, it attracts, it compells its viewer to 'come closer', it invites thought. It has aura. Benjamin, "Little History of Photography"
 Phillips, Fixed - Artist Statement. BENJAMIN, Walter. (2008) 'Little History of Photography'. In: Jennings, M., B Doherty, B. and Levin, T. (Eds.) The Work of Art in the Age of Its Technological Reproducibility, and Other Writings on Media. Cambridge, Ma: The Belknap Press of Harvard University Press. BENJAMIN, Walter. (2008) 'The Work of Art in the Age of Its TechnologicalB Reproducibility: Second Version'. In: Jennings,B M., Doherty, B. and Levin, T. (Eds.) The Work of Art in the Age ofB Its Technological Reproducibility, and Other Writings on Media. Cambridge, Ma: The Belknap Press of Harvard University Press. ENWEZOR, Okwui. (2008) Archive Fever: Uses of the Document in Contemporary Art. New York: Steidl/ICP. HANSEN, Miriam Bratu. (2008) "Benjaminbs Aura." Critical Inquiry, N. 34, Winter. JOHNSTONE, Stephen. (2008) "Introduction//Recent Art and the Everyday." In: Johnstone, S. (Ed.) The Everyday. London: Whitechapel Gallery. MENKMAN, Rosa. (2011) 'Glitch Studies Manifesto.' In: Lovink, G. and Miles, R. S. (Eds.) Video Vortex Reader II: Moving Images Beyond YouTube. Amsterdam : Institute of Network Cultures. MITCHELL, W. T. J. (2005) What Do Pictures Want? The Lives and Loves of Images. Chicago: The University of Chicago Press. MORADI, Iman. (2004) Gtlch Aesthetics. Dissertation for the BA in Multimedia Design: University of Huddersfield. SOTIRAKI, Virginia. 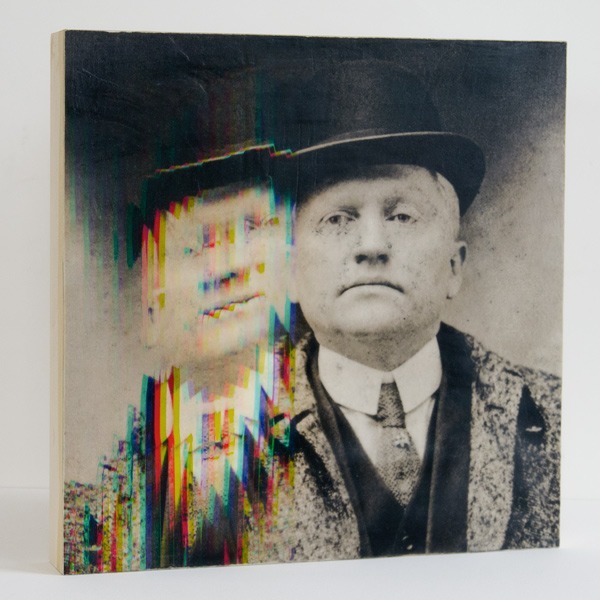 (2014) Glitch Art Narratives:B An Investigation of the Relation between Noise and Meaning. Thesis for the Degree Master of Arts in Visual Culture: Lund University. Sofia P. Caldeira, born in Funchal, 1990. Studied Art & Multimedia in the Faculty of Fine Arts (University of Lisbon). In 2012 started a Masters in Anthropology - Visual Cultures at the Faculty of Social Sciences and Humanities (New University of Lisbon), concluded in 2014. Presently works as an independent researcher.